Editor's Note: The DDN contacted the author in preparation for this story, which reveals that pro-concealed carry letters, calls, faxes and emails outpaced those sent by anti-gunners by more than 11 to 1 since Taft took office in 1999. Following the DDN story, is documentation of the wealth of information we provided the DDN on the history of OFCC's grassroots fight, but which Bischoff was not able to use in her story. COLUMBUS -- When it comes to political contributions, the gun lobby outspent gun-control advocates 32 to 1 since 1995, the year legislative supporters first began pushing for a bill to allow Ohioans to carry concealed weapons. Gun advocates also sent 11 times as many letters, faxes and e-mails to Gov. Bob Taft and called his office 3 1/2 times as much as opponents of the concealed-carry bill did. And gun-rights groups put the pressure on state leaders over the years by packing hearing rooms, holding demonstrations, and signing petitions. Simply put, they outgunned their opponents. "The volume was very intense. And that is on both sides. I'd say the proponents outweighed the opponents about two to one," said state Rep. Jim Aslanides, R-Coshocton, the sponsor of the concealed-carry bill that Taft signed into law this year. Pro-gun rights groups, including the NRA, Ohio Gun PAC and Gun Owners of America, gave legislative candidates and other state candidates $208,228 in political contributions since 1995, according to data from Ohio Citizen Action and the Ohio Secretary of State's Office. In contrast, Handgun Control Inc.'s political action committee gave $6,524 in 1998 and nothing in the other years, according to secretary of state records. But calls and letters have a greater influence on lawmakers than campaign contributions, both Democrats and Republicans said. "The grass-roots effort, I would say, is the most important effort in the legislature because that causes representatives to be delegates of their district. They are hearing the call of the people back home," Aslanides said. Since Taft became governor in 1999, his office received 41,938 faxes, letters and e-mails from supporters of carrying concealed weapons and 3,732 faxes, letters and e-mails against it. Taft's office began tracking telephone calls on the issue in late 2000. Between 2001 and this week, his office received 5,910 calls for it and 1,664 calls against it. State Rep. Ed Jerse, D-Euclid, a vocal opponent of the concealed-carry bill, said the gun-rights grass-roots movement scares politicians because gun advocates can unleash a torrent of opposition in an election. "I think that people are more influenced by the grassroots mobilization — the fear that the group is going to target them in a race. It's very much a wedge issue, it's a swing issue, it's an issue that can influence the swing voters," Jerse said. State Sen. Eric Fingerhut, D-Shaker Heights, another conceal-and-carry opponent, said the gun lobby mobilized a minority so that their voices were heard disproportionately to the silent majority who, Fingerhut said, oppose the measure. "It's like comparing the Army's 5th Division to, like, the Boy Scouts. They aren't even playing the same game," Fingerhut said. But Chad Baus, spokesman for Ohioans for Concealed Carry, said the gun groups' stronger grassroots campaign reflects that most Ohioans wanted the right to carry concealed weapons. "There is not a huge anti-gun movement in America. It's just not there," Baus said. Instead, he said, the vocal anti-gun minority managed to hold up the concealed-carry legislation for nine years, in part, by predicting doom and gloom scenarios should the legislation be approved. Media sympathetic to gun control gives these groups better coverage, which influences politicians, Baus said. Aslanides isn't willing to hand so much credit to the media. "That may be true to some part. I believe concealed-carry didn't pass (in prior years) not because of the media but because of the governor's office," Aslanides said. "There were key people in key positions that killed the bills." Former Gov. George Voinovich threatened to veto concealed-carry bills and former House speaker JoAnn Davidson killed a House bill. Taft's position, meanwhile, stalled the measure through the first five years of his tenure. He initially threatened to veto any bill that did not have the support of major law enforcement groups, and later modified this to say he would sign a bill that police did not oppose. Baus called Taft and Voinovich "liberal Republicans" and said the legislature had enough such Republicans that veto threats killed prior bills. But after years of letters, phone calls, hearings, pressure and campaign contributions, Ohioans will be able to get a permit to carry concealed weapons beginning April 8 when the new law takes effect. Adult residents who pass a background check — a felony conviction is among the conditions that disqualify an applicant — and who take required training will be able to obtain permits from their county sheriff. Ohio joins 34 states that require police to issue permits to qualified applicants. In 11 other states — including high population states such as California and New York — police have the discretion when it comes to issuing concealed-weapons permits. Four states — Illinois, Kansas, Nebraska and Wisconsin — do not issue permits to carry a concealed weapon. WCPO.comFollowing is documentation of the wealth of information Chad Baus provided the DDN on the history of OFCC's grassroots fight, but which Bischoff was not able to use in her story. 1) Letters to Taft's office in favor of concealed-carry outnumbered those opposed by 20 to one in the past six months - calls were 10 to 1 in favor of concealed carry. Does that margin surprise you? No, it doesn't. We've known all along that the anti-gun movement was nothing more than a very small, vocal minority who are often made to look larger and more influential by a sympathetic media. The thing to keep in mind here is that some of the opponent calls were from "pro-gun" people. A few pro-gun groups (the Ohio Gun PAC and Gun Owners of America) opposed HB12 because they viewed it as too restrictive. Thus the calls driven in by gun control groups were truly even less than the few hundred opponent calls. What's more, on our two websites, we stopped encouraging calls to Taft in 2002. Since it became apparent that Taft would throw new obstructions in front of the bill, no matter how much they compromised with him, we began encouraging people to call the Ohio GOP, the Republican National Committee, and the Republican Governor's Association about their frustration with Taft, instead of wasting more calls or ink talking to a brick wall. Many supporters emailed us in 2003 indicating that they had begun calling the Bush Campaign with that same message. More proof that "political pressure from above" forced Taft's hand? 2)What sort of effort, over the years, did OFCC and its members put forth? It was a huge, 100% grassroots effort on Ohioans For Concealed Carry's part. OFCC was formed by a group of Cleveland-area friends in 1999. As the group grew, more steering committee members were brought in to the organization. OFCC's all-volunteer steering team put in countless hours - 3 to 5 hours per day - and continue to do so. The first step was making people aware of OFCC's existence. Since the plan from the beginning was that OFCC would be largely Internet driven, initial efforts were focused on promoting the website URL - www.OhioCCW.org. Volunteers fanned out across the state to set up tables at gun shows, and collect petitions calling the legislature to act. All told, over 50,000 signatures were collected before concealed carry reform was made law. Burma Shave-style signs were also erected by volunteers on heavily traveled roads throughout Ohio. Bumper stickers with the website URL were also distributed at gun shows, and provided to all new OFCC members, with the slogan - "Criminals Prefer Unarmed Victims". 3) How many cards and letters sent and phone calls made to lawmakers and the governor's office? Letter-writing capabilities (via email, postal service, and fax), were, and are now, operated mainly via the website. By typing in a zip code, a concerned constituent is provided information for their Ohio Representative and Senator, as well as the Governor's office. OFCC members and volunteers generated thousands upon thousands of letters over the last 5 years. The exact numbers received would be much more accurate if obtained from the officials' offices, since it's possible some opted not to use our letter system, but to send letters on their own (and since we'd have no way to tabulate phone calls). As I told you yesterday, the numbers provided to you by the Governor's office on the overwhelming ratio of pro-self-defense letters(nearly 20 to 1!) and phone calls (approx. 10 to 1!) to anti's did not surprise me one bit. As the 2004 Zogby International American Values Poll indicates, American voters overwhelming favor these self-protection laws, by a margin of 79% to 18%. Right-to-Carry drew better than 70% support in every demographic group, with even non-gun owners indicating their backing by 73% to 23%. The 2001 Ohio Buckeye State Poll found the same was true of Ohioans, even before the 9/11 attacks (which seem to have tilted Americans to be even more supportive of Second Amendment issues). When asked their opinion of a law similar to HB12 (training and background checks), 67% of Ohioans indicated their support. Continued claims by Toby Hoover and Lori O'Neill that the majority of Ohioans don't want concealed carry are simply false, and everything from the letter & call ratios to the Zogby and Buckeye State polls prove it. Off-topic, but very interesting: Zogby found that gun owners have more of a respect for human life than non-gun-owners: Gun owners were considerably above the national level in their belief that abortion is manslaughter by a 59% to 31% margin. Non gun-owners were more evenly split on the question with 47% thinking abortion is manslaughter and 40% who felt it wasn’t manslaughter. 4) How many demonstrations staged, press contacts & op-ed pieces done, lawmaker contacts made? Before the Sept. 2003 Supreme Court ruling on concealed carry, OFCC "demonstrations" came mainly in the form of concerned citizens packing hearing rooms and galleries when the issue was being considered. OFCC's trademark blue-denim shirts became well-known by legislators, and a quick visual indicator of how many people were will to take time off work, and away from their families, in order to make the trip to Columbus to support the issue by offering testimony, or simply by being there. The Supreme Court ruled that while Ohioans have a "fundamental, individual right to bear arms for self-defense", a legislative ban on concealed carry was Consitutional since the practice of open carry was allowed. Opponents of concealed carry quickly jumped on this ruling as a victory, but it clearly was anything but a victory for this small vocal minority. The 2003 Supreme Court ruling on Klein vs. Leis, et. al. was the final impetus to passage of Ohio's new concealed carry reform law. Four days after the ruling, on September 28, the first of nearly 20 Open Carry 'Defense' Walks was held. The intent of these events was to point out the absurdity of a law which allows persons to carry firearms openly, without background checks or training of licensing of any kind, while banning concealed carry proposals (which WOULD utilize background checks, training and licensing) with claims they are "unsafe". In all, OFCC coordinated with local organizers on 'Defense' Walks, including high-profile Walks outside the State House and Governor's mansion. Senator Marc Dann (D) participated in the Youngstown event. OFCC also promoted a Walk in Manchester, the hometown of Senate President Doug White. The Manchester 'Defense' Walk was held in honor of Dayton resident James A. "Tony" Gordon, who was murdered in a carjacking in August 2003. White had been refusing to appoint conferees to a committee on HB12. He announced appointments just 2 days after the Manchester Walk. Tony Gordon's case, and his family, deserve some attention in Dayton, Laura. More on that under "press contacts" below! OFCC sent out it's share of news releases over the past 5 years, the most important of which went uncovered by Ohio's news media. In September 2003, OFCC released a significant study by Univ. of GA Prof. David Mustard, examining how crime was projected to be reduced by a concealed carry law in Ohio. In Ohio, the study was covered only by the Toledo Blade. Ohio – The Heart of All Defenselessness, along with graphical representation of the data sets, can still be obtained at www.OhioCCW.org or by contacting OFCC by phone or email. The report compares estimates based on FBI Uniform Crime Report data and the nationwide "before and after" effects experienced after the passage of concealed carry legislation. The NRA's national publication, America's First Freedom, also covered this study extensively in a story on Ohio's concealed carry fight last December. Perhaps most importantly, Gongwer News Service covered the news of the study, which ensured that it would be seen by legislators. In October 2003, the Ohio media failed to cover OFCC's establishment of the Tony Gordon Memorial Fund (most disappointing was lack of coverage in Gordon's hometown of Dayton). Gordon was shot by a carjacker on August 5, while driving home with his 13-year old nephew as a passenger in the vehicle. Ohioans For Concealed Carry is concerned with all criminal victimizations - the desire to reduce violent crime is a key reason why we advocated the passage of a concealed carry law. What brought us special concern in Tony's case was the manner in which he was victimized. According to Lt. John Huber, Dayton Police department, Tony was killed while trying to "drive away" from his attacker "and was shot for it." For months prior to Tony's tragic death, Ohio State Highway Patrol bureaucrats had been emailing concerned citizens, stating that "the fundamental nature of a motor vehicle" allows persons who are victimized to "drive away from an attacker." Tony tried to drive away, and he died. His family became quick advocates for concealed carry reform, with Tony's mother Phyllis saying "I would urge everyone who believes that we have the right to carry a weapon to defend ourselves, such as in the situation that my son was put in, to please contact your congressmen and let them know how you feel! Maybe if Tony was able to have a weapon, he would be here now!" In November 2003, another media release went ignored by the media - the announcement that Ohioans For Concealed Carry had formed what was possibly the largest civil-defense rights coalition in state history, calling on the legislature and Taft to finally finish the job and pass HB12 into law. Representing one quarter of a million Ohioans, the Civil-Defense Rights Coalition was comprised of five Second Amendment-related groups, including the National Rifle Association, the Ohio Rifle & Pistol Association and the Second Amendment Sisters; the Buckeye State Sheriff’s Association (representing Ohio’s highest-ranking law enforcement officials); more than 50 Ohio businesses; and the Ohio Young Republicans (the entire list of Coalition members can still be viewed on our website). Many op-eds were submitted by OFCC under an official banner, and some were published here in Ohio - in Crain's Cleveland Business, Lima News, Findlay Courier and Van Wert Independent, to name four. On a national level, op-eds written by OFCC steering team members have been published at Bushcountry.org, Cnsnews.com, Townhall.com, and Crosswalk.com. Letters to the editor have been published on the subject in nearly newspaper in the state repeatedly over the years, written by the large grassroots following that this issue generated, as well as by the OFCC steering team. As discussed previously, individual grassroots contacts likely numbered in the tens of thousands. As for official OFCC contacts, there were a couple of people who became our chief lobbyists over time, and their contacts with legislators would be too numerous to count. OFCC was also involved in providing legislators with facts on issues that were raised during the debate. For instance, when the Senate began to question a provision in the House version of HB12 which would prevent businesses from banning firearms in their person vehicles on company parking lots, OFCC obtained information from the Kentucky Chamber of Commerce which proved that state had had no problems with their parking lot exemption, since their concealed carry was passed in 1995. Unfortunately, the Senate committee still decided to remove the exemption, and thus when businesses exact a parking lot ban, employees and customers will be forced to travel defenseless to and from work. 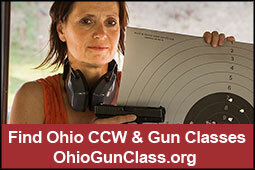 5) When did the first CCW bill get introduced in Ohio? Why did it take so long to finally get one passed? The first CCW law was introduced in 1995. The reasons it took ten years to pass have nothing to do with the merits of concealed carry reform laws, nor with overwhelming grassroots support, and have everything to do with politics. It surprises many outside Ohio to hear that this entire debate has occurred while Republicans control the House, Senate, and Governor's office. Both George Voinovich and Bob Taft are liberal Republicans, and there have always been enough in the legislature who shared this trait to make the threat of a gubernatorial veto enough to kill the measure. One of the reasons the OFCC PAC was formed in 2002 was to empower citizens to replace legislators who were more concerned about with Republican "party solidarity" (as Sen. Carnes put it last year), than they were with protecting the rights of the defenseless. We were successful in increasing the pro-concealed carry majority in the House and Senate in 2002. Unfortunately, personal support for this issue wasn't enough for a few term-limited Senators in 2004. Senate President Doug White freely admitted to reporters in December that a few Senators were afraid to commit to a veto-override on concealed carry because they were hoping for job appointments from Taft. Sen. Carnes, referenced above, was in fact term-limited, and did in fact get his Taft appointment. The real question is, why did Gov. Taft finally allow a compromise to be reached? One theory is that in a Presidential election, with Ohio being a battleground state, there was national pressure on Taft to get this "bread and butter" conservative issue off of the table. When Bush visited Columbus last October, the local media widely covered the presence of protestors carrying signs with slogans such as Taxman Taft is a liability for Bush, No CCW in Ohio in 2003, no vote for Bush in 2004?, and Hey Bob, Bush signed CCW in Texas, why won't you? Attorney General Jim Petro commented in late November that GOP infighting in Ohio was hurting Bush's re-election chances. We have even heard from Republican officials that the Bush campaign has been warned that even though Taft is the honorary chair of Bush's re-election efforts in Ohio, that the President shouldn't be seen anywhere near Taft when he visits Ohio. 6) How many Ohioans do you expect will apply and be granted permits this year and next year? Over 60,000 applicants received licenses in Michigan the first year. We believe Ohio will exceed that number in the first 12 months, not only because of our larger population, but also because unlike Michigan, Ohioans previously had absolutely NO way to obtain a license to carry. 7) Can Ohioans get their training now, in preparation for when the law takes effect April ? Yes, and in fact, the Ohio Attorney General's office is encouraging people to do so on their website. OFCC has announced the establishment of the Ohio Concealed Carry Education Foundation, and a new website to bring certified trainers together with persons who want training - www.ohioccwtraining.org. One other note: When we spoke yesterday, I mentioned the most recent FBI Uniform Crime Report indicated a 10.5% drop in crime in Michigan over the past two years (since they passed their concealed carry law), while Ohio's rate went up 5%. When we discussed causality, I should have said that while no one has done so yet in Michigan, it would certainly be possible to investigate and prove or disprove causality, using statistical regression analysis. It is this method by which researchers such as Gary Kleck, Joyce Lee Malcolm, Bruce L. Benson and Brent D. Mast, Carlisle E. Moody, Florenz Plassmann, John Lott, David Mustard and T. Nicolaus Tideman have proved that these laws have worked to reduce crime in other states. Thank you for the opportunity to answer some questions for your story on the organization and lobbying efforts it took to get CCW passed in Ohio.